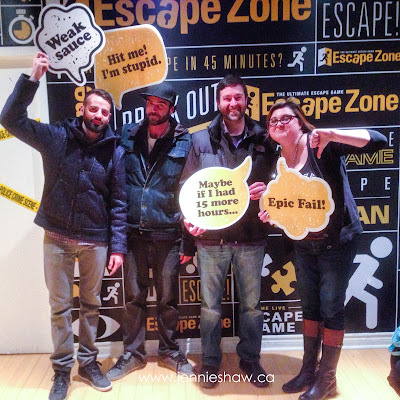 Last weekend, The Remix and I decided it was high time we used our gift certificates for a super cool place called Escape Zone, where you're locked inside a theme room, along with up to four other people. You're given 45 minutes to escape the room, by solving a series of puzzles. Sounds fun, right? That's what we thought! So we invited my baby brother (who'd given us the gift certificates), along with one of his friends, and made a reservation for 6:30pm. Naturally, I was so excited that I spent some time on Saturday morning, doing a theme mani. Later that afternoon, while The Remix and I drove down to Toronto, we began to get nervous. What if we didn't escape? What if it was way harder than we thought it'd be? What if we couldn't even solve one of the puzzles, let alone all of them? For being a fun night out, it was starting to get stressful. That stress increased about an hour before our reservation, with both my baby brother and his buddy, echoing the same concerns. We'd chosen an intermediate room, but having zero experience escaping from any room at all, we were worried that we'd overestimated our sleuthing skills. Arriving at Escape, we noticed a long hallway, filled with tiny pictures of previous teams. There had to be a few thousand. It was crazy! Many of the photos had smiling people, delighted with themselves and holding up signs that said things like: "Smartest ever!" "Nailed it!" And other celebratory exclamations. But there were also quite a few pictures with bummed-out faces and far less enthusiastic signs like: "Weak Sauce," and "Maybe if I'd had 15 more hours." Oh God, we muttered to ourselves. We really don't want to be in a sad face picture. A staff member told us that no electronics were allowed in the room, so we locked our stuff up before being brought into the room we'd chosen, the Music Studio. Without divulging anything specific, I've put together a gif-tastic representation of our time at Escape, which could best be described as 45 Minutes of The Most Intense Contrasting Emotions of My Life. As the clock in the room began at 45:00 and counted down, I will keep to the same format. 45:00 - We're locked in the room, brimming with optimistic confidence and a can-do attitude: WE WILL ESCAPE! 35:00 - After ten minutes, we're confused as to how we're so dumb because we're still stuck on the first clue. 32:00 - First call for a clue. 30:00 - Our first celebration, thanks to the hint from the desk gal. 25:00 - Collective, mounting nervousness, because the second puzzle stopped us dead in our tracks for way longer than it should have. 20:00 - Our second Celebration, after we figured it out, all by ourselves. TAKE THAT, ROOM! 15:00 - Utter despair because we'd spent another five whole minutes on the next puzzle and were convinced it was actually a trick and we'd be stuck in the room forever and ever. Thank goodness for the help button because we would've NEVER figured that particular puzzle on our own. For reals. Only a freaking genius could have put those two elements together (and clearly, we weren't geniuses, haha!). 13:00 - Third Celebration, after solving the fourth puzzle all on our own. 10:00 - Fourth Celebration! Including a group high-five because we'd managed to solve two puzzles in a row, leading us to consider filling out MENSA applications upon our escape. 5:00 - Complete Panic because we only have five minutes left and we can't figure out what we're doing wrong because we're 99.9% sure we solved the puzzle, but we're still stuck in the room. WHAT THE HELL, ROOM?! 1:30 - Our scrambled, victorious emergence from first room, cheering because WE RULE EVERYTHING AND ARE THE SMARTEST EVER OF LIFE!! 0:00 - Time runs out but we're still in the second room. The external door is locked. Confusion abounds. +1:00 - Staff member enters room, unimpressed with the celebratory cheers he must have heard pre-our discovery of still-locked door. Because we'd only made it halfway. HALFWAY, PEOPLE. In hindsight, I probably shouldn't have jinxed us by painting a theme mani with a locked lock. We'd been doomed from the start. Haha! The staff member spent about five minutes explaining the rest of the second room, and we just stood there, shaking our heads. This room was bananas crazy, guys. BANANA CRAZY. We could've had double the time and we still wouldn't have figured it out. Our sad-face picture. Whomp, whomp. So I'll leave you with this thought: if you're going to Escape for the first time, pick the easiest room, and if you HAVE to do a theme mani, make sure it represents you actually escaping. Trust me, you'll thank me afterwards. Haha! Ever tho you guys failed. At least you had cute nails. Wait, it was made for 6 people and you only had 4? Oh, man- way too tough! When we were SOFRIGGINGCLOSE to escaping our easy-rated one, we had a 8 people. Definitely max it out next time. And I hear ya- when you don't know what the expect, it's like....what do I do with this thing? How..? At least you know your celebration skills are still awesome!